Presenting more fireworks, network soda commercials, cleats and helmets than we can ever expect latex couture (unless Lady Gaga is playing the halftime show) still the Super Bowl seems to tickle everybody’s interest. And although the last thing anyone of us expects is any real moment of spectacular alt. fashion revelation, there were a few moments from yesterday’s game that gave us particular pause…and some of them even fashionable. Although lots is being made today of Maroon 5’s Adam Levine going bare-chested during his band’s half-time performance, the shirt he was wearing (for a little while ) did garner some attention. Danish furniture designer Verne Panton created the brown tank Mr. Levine sported. Panton, who died in 1998, is best known for his Panton Chair and textile art. And speaking of a talented gentleman working slightly out of his usual milieu, for the game Ridley Scott directed a commercial for Turkish Airlines. 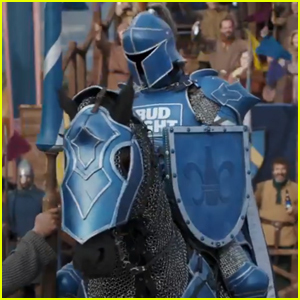 One of the wildest spots and surely a crossover nobody saw coming was the marriage of Bud Light and “Game of Thrones.” Meeting in a jousting pitch, the Bud Knight was murdered last night by the GoT’s character “The Mountain.” If that wasn’t shocking (and hilarious) enough, all of the commercial’s spectators were burned to a crisp at the end by a dragon. Not that any of us needed a reminder of GoT’s popularity. But when a cable series has infiltrated into the mainstream ranks of an American beer brand institution–during the Super Bowl no less—one might consider that cable series to have made its mark. Often it is the commercials of the big game that get big notice. Like them or not, Super Bowl LIII certainly had its share of spots people are talking about the day after the game.